Did you know that there are more than 1,000 ways to get involved here at Ohio State? Yeah, you read that correctly. Ohio State has more than 1,000 different groups and organizations that you can get involved with on campus. If you’re struggling to find fun things to do with your spare time, fear not — this blog series is here to save the day! Oh great, he’s talking about getting a job again. Yes, I realize I’ve mentioned campus employment in several previous posts. However, there is a pattern here — working for the university has a lot of benefits, especially if friendship and involvement are what you are looking for. Currently, I hold two campus positions: I am an office assistant in Morrison Tower and I am a telecounselor for Undergraduate Admissions. Therefore, as somebody who has plenty of experience in terms of campus employment, I can tell you with certainty that finding a campus job is one of my personal favorite ways to get involved at Ohio State. If you’re looking to make friends, then this is a great option for you: Both of my current positions have given me an abundance of opportunities to meet people with similar interests and make some new friends. If you’re looking instead to make connections with staff members and develop transferable skills, then this is a great option for you too! 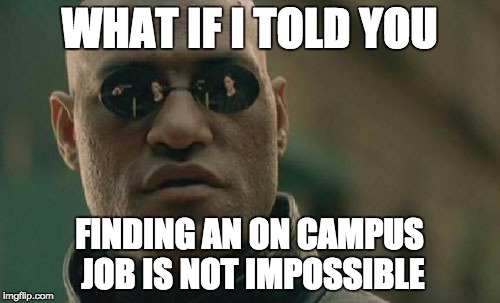 Campus employment will give you the opportunity to work with supervisors who understand that you are a college student and who wish to help you build your resume for the eventual “real” job search (or grad school application). I’m not exaggerating when I say that getting a campus job is one of the best ways that you can get involved here at Ohio State! So, great, you should get a job; how will you know what’s right for you, though? Where can you apply? If you are considering working for Ohio State as a student employee, I would strongly recommend that you check out the Student Job Board. There, you can search for jobs by keyword, department and location. You’re practically guaranteed to find something that is perfect for you! 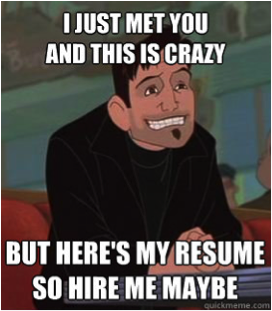 If you need help with your resume or cover letter, Career Counseling and Support Services offers some great tips. Finding the right job might take some time and dedication, but in the end, I promise that it’s definitely worth it! Freshman Year Survival Tip #2: Your Professors Don’t Hate You! Hi everybody! My name is Joey, and I love reading, writing, music, dogs, and anything that involves food. I talk way too much (even if you don’t want to listen), so be warned! However, if you ask me about anything related to math, I probably won’t have much to say. Ohio State was always my top choice school, so I am looking forward to sharing my passion for this university with you all. I hope you enjoy!